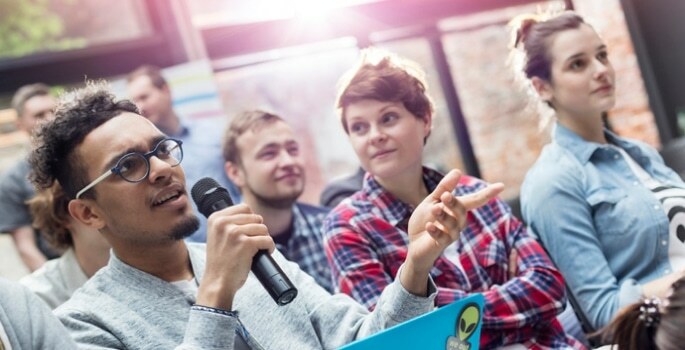 In a connected world where information is a commodity and communication is everything, universities are harnessing active learning to engage with a new generation. The generation that grew up with the internet, Generation Z, is now moving into higher education with a vastly different set of expectations, demands and aspirations to previous generations. Against a backdrop of instantaneous communication and entrepreneurial self-reliance, universities need to understand what motivates and stimulates Generation Z and prepare for the future of learning. Members of Generation Z see technology as life, with detailed answers to all possible questions available at the swipe of a screen. They expect a world where they are placed at the heart of information and entertainment; communicating, interacting and shaping the conversation. When it comes to education, they respond well to active learning as they want to engage with information instead of just absorbing it. The traditional method of teaching through lectures alone holds little interest to Generation Z, and to tackle the challenges ahead, insightful universities are investing in technologies that support independence and bring flexible and collaborative learning to the fore. Instant access to facts, data and explanations has been the foundation of childhood for Generation Z. They’ve grown up with the ability to filter large amounts of information, multitask with ease and focus on the opportunities that will help them make their mark. For them, university life isn’t just about receiving and absorbing information. What’s important is to be encouraged to use that information, interact with it, understand it and come up with their own solutions. Generation Z has grown up in a world that’s always on, where communication is instantaneous, and continuous collaboration is the norm. 89% say they spend part of their free time doing productive and creative activities, and two out of three say that technology makes them feel like anything is possible. Students thrive on a fully-immersive educational experience, enjoying the challenges of contributing to the learning process, participating in collaborative sessions and feeding off the energy of an interactive environment. Technology enables this active participation and ensures students understand a topic on their terms, weighing up its value in a way that passive teaching methods just don’t allow. Due to the dynamic, collaborative environment that they’ve grown up in, Generation Z is uncomfortable adapting to the traditional methods of learning that higher education is often based on. To appeal to the students of today and tomorrow, and cater for their high expectations, forward-looking universities are bringing visual communications, dialogue and active learning into the lecture hall and across the campus. It’s the future of higher education and it’s happening right now. If you want information, just Google it! If that is so, what value do libraries and archives add to the experience of higher education, and who actually needs them? What does the progression from Generation Y to the even-more-tech-savvy Generation Z in 2018 mean for student accommodation?